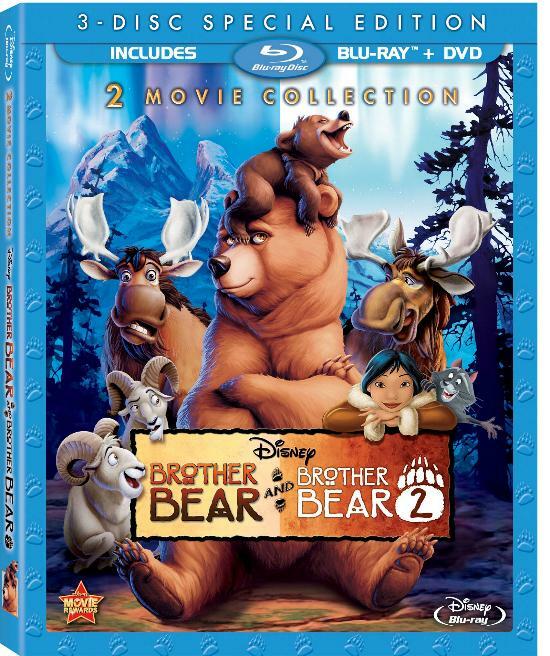 Disney proudly presents two heartwarming and hilarious movies in one incredible collection - Brother Bear, the 2003 Academy Award nominee for best animated feature, and Brother Bear 2 - together for the first time on Blu-ray. Bring home an entire forest full of fun, complete with digitally restored high definition picture and sound. After an impulsive boy named Kenai is magically transformed into a bear, he and his little brother bear, Koda, take a courageous (and often hilarious) journey to see the Northern Lights. Experience the excitement of these two fantastic films like never before on Disney Blu-ray! I remember watching the first Brother Bear. I cried a bit because of the bond between Kenai and Koda. This time around watching it again with my little ones it made me think of my kiddos. They are so close and are very protective of each other just as both the brother bears. It was a great movie and hilarious as well. I loved the two Canadian Moose. They were always keeping both my kids entertained and kept them laughing. Although I love Brother Bear one, I think I really loved Brother Bear 2 a bit more. Both movies are wonderful, but I think I loved this one a bit more because of the love interest and their history and how they come together. This was still funny, but I loved that Kenai got to be with the girl he loved as a child. These are definitely movies that you should definitely watch. The music from both movies are pretty awesome. Check below at the trailer below of the second movie. Disclosure: All opinions are my own. I received Brother Bear & Brother Bear II at no cost for the purpose of this review. No other compensation was received.